"RABBIT!.. RABBIT!.. RABBIT!..... " "RIBBIT!!" she is so cute! !, great illustration. 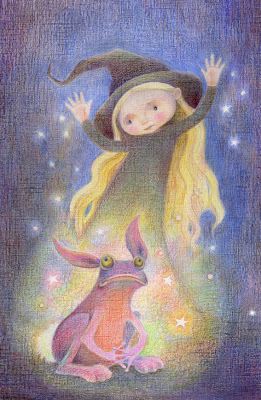 Fantastic, I love this illustration, and adore the little mixed breed bunny/frog so cute! can i adopt this "Ribbit"
but the illustration is soooo cute! wow , this is awesome , great work! Kathy's back! YEAHHHHHH! Yippee! Now that's magical concentration! Beautiful as ever! Big hugs to you! This is GORGEOUS!!!!! Beautiful use of colour and such a cute picture! Love it!! So great Kathy!! Love your froggyrabbit! He's adorable. Your wizardress is so cute. Always love stopping by to see what you've come up with! You never disappoint. Sweet, Hilarioius, and FUN!!! I love this so much!! Wait..... Ribbit.... Ribbit.... I have a frog in my throat! he he he he! Great work. yikes. you wield those color pencils like wands, kathy. just lovely! Flippin heck Kathy! That's one UGLY RABBIT!!!! lol. I've been busy too but my Ugly Rabbit's way too cute!! Hahaha! Love it. That is one seriously ugly rabbit! Fabulous as usual. The softness and colours. The expression of the rabbit is priceless. So magical and very beautiful colors! Funny! And it looks great! What a beautiful style you have - what a clever idea too, love it! Extraordinary illustration, great concept and i love the way you color. Delightful illustration! I love her exhuberance...and the wonderful colors. Always love looking at your work - so skilled.